190 Commonwealth is located on the south side of Commonwealth, between Dartmouth and Exeter, with 184-188 Commonwealth to the east and 192 Commonwealth to the west. 190 Commonwealth was built in 1881 by Keening & Fellows, builders, for real estate dealers Samuel Horatio Whitwell and his brother, Henry Whitwell, for speculative sale. Henry Whitwell is shown as the owner on the original building permit application, dated April 16, 1881. Samuel Horatio Whitwell purchased the land for 190 Commonwealth on November 20, 1879, from the estate of shipping merchant Richard Baker, Jr. The estate had purchased the land on March 5, 1875, from the Commonwealth of Massachusetts. Richard Baker, Jr., had died in January of 1875. Prior to his death, he and his wife, Ellen M. (Whittemore) Baker, had lived at 152 Commonwealth. Click here for an index to the deeds for 190 Commonwealth. By the 1883-1884 winter season, 190 Commonwealth was the home of paper manufacturer Mortimer Blake Mason and his wife Mary Emma (Phillips) Mason. The previous season they had lived at 39 Marlborough. They continued to live at 190 Commonwealth until about 1889, when they moved to the house they had built at 347 Commonwealth. 190 Commonwealth was not listed in the 1890 and 1891 Blue Books. On October 31, 1890, 190 Commonwealth was purchased from Samuel Horatio Whitwell by Sylvia Church (Sampson) Winslow, the wife of coal dealer George Marcus Winslow. They previously had lived at 68 Rutland. George Winslow died in October of 1896. 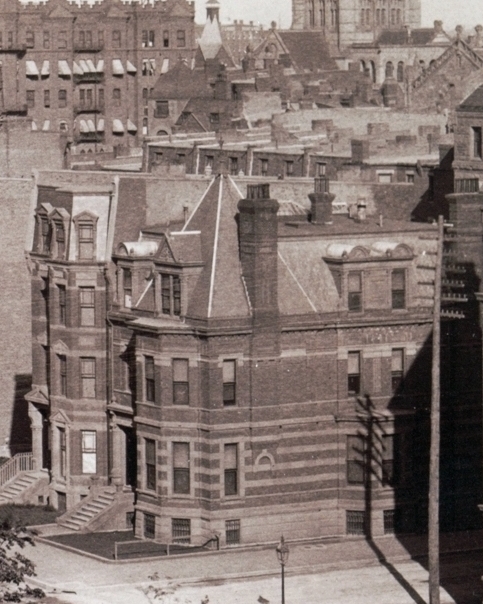 Sylvia Winslow continued to live at 190 Commonwealth in 1898, but moved thereafter. During the 1898-1899 winter season, 190 Commonwealth was the home of Adams Sherman Hill and his wife, Caroline Inches (Dehon) Hill. They previously had lived at 302 Marlborough with their son and daughter-in-law, Arthur Dehon Hill and Henriette Post (McLean) Hill. Adams Sherman Hill was a professor of rhetoric at Harvard. He formerly had been a journalist, and was one of the founders of the Independent News Room, a competitor of the Associated Press during the Civil War. By the 1899-1900 winter season, 190 Commonwealth was the home of William A. Rust and his wife, Dora (Drummond) Rust. William Rust formerly had been Secretary of the Eau Claire Lumber Company in Wisconsin, where he had served as a State Senator in the late 1880s. They continued to live at 190 Commonwealth during the 1901-1902 winter season, but moved soon thereafter to 349 Commonwealth. 190 Commonwealth was not listed in the 1902 Blue Book. During the 1902-1903 winter season, it was the home of Dr. Charles Goddard Weld and his wife, Hannah Putnam (Train) Weld. They had lived at 303 Commonwealth during the 1901-1902 winter season. Charles Weld was a physician and surgeon. He was a noted art collector specializing in Japanese art. By 1904, they had moved to a new home they had built at 149 Bay State Road. 190 Commonwealth was not listed in the 1904 Blue Book. On August 8, 1904, 190 Commonwealth was purchased from Sylvia Winslow by Euretta (Lent) Reed Flagg, the wife of George Flagg. George Flagg died in June of 1907. Euretta Flagg continued to live at 190 Commonwealth until her death in January of 1917. Their son, Dr. Elisha Flagg, a physician, also lived at 190 Commonwealth (and maintained his offices there) until his marriage in November of 1909 to Eleanor Amelia Marguerite Cecilia (Shattuck) Whitney, the widow of Hugh Whitney. Before their marriage, she had lived at 14 Gloucester. After their marriage, Elisha and Eleanor Flagg moved to 164 Marlborough. 190 Commonwealth was not listed in the 1918 and 1919 Blue Books. On May 26, 1919, 190 Commonwealth was purchased from Elisha Flagg by Marcellus Seth Ayer. He and his wife, Hattie Mabel (Dodge) Ayer, made it their home. Marcellus Ayer was a former wholesale grocer. In 1883, he founded the Working Union of Progressive Spiritualists which built the First Spiritual Temple at 26 Exeter (181 Newbury), across the alley from 190 Commonwealth. In 1914, it was converted into the Exeter Street Theatre, which he operated and his wife managed. 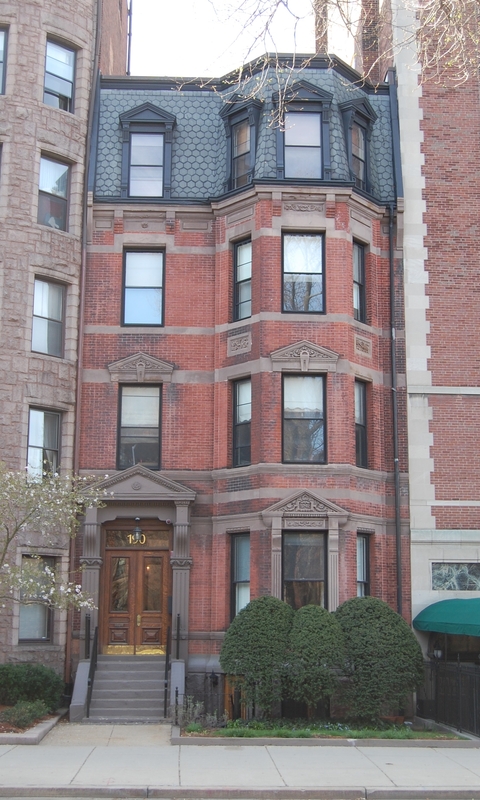 The Ayers also lived at 181 Newbury until buying 190 Commonwealth. In June of 1919, Hattie Ayer applied for (and subsequently received) permission to construct a two-car garage at the rear of 190 Commonwealth. Marcellus Ayer died in January of 1921. Hattie Ayer continued to live at 190 Commonwealth during the 1921-1922 winter season, but moved thereafter and by the 1923-1924 season was living in an apartment at 8 Gloucester. During the 1925-1926 winter season, she was living in an apartment at 180 Commonwealth, and by 1927, she had moved to an apartment at 90 Commonwealth. In that year, she remarried to Salvatore Paparone, a dancing teacher. They continued to live at 90 Commonwealth, where she died in 1930. By the 1922-1923 winter season, 190 Commonwealth was the home of Charles Barnard Prince and his wife, Halldis (Möller) Prince. They previously had lived at 256 Beacon. He was assistant treasurer of the American Tube Works, manufacturers of brass tubing. On October 2, 1925, 190 Commonwealth was purchased from Hattie Ayer by the estate of Joseph Story Fay, Jr. The Fay estate already owner The Abbotsford apartments at 184-186-188 Commonwealth. Thereafter, 190 Commonwealth and 184-186-188 Commonwealth remained under the same ownership. 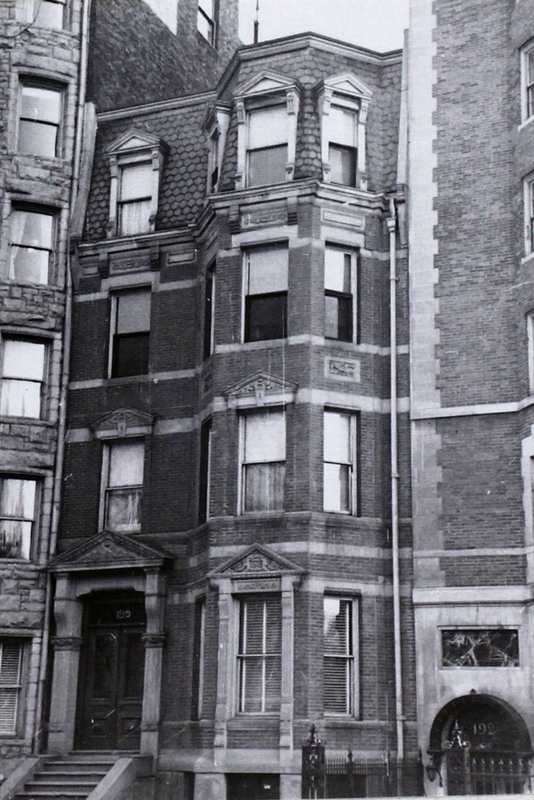 Charles and Halldis Prince continued to live at 190 Commonwealth 1926, but had moved to 16 Charles River Square by 1927. In December of 1929, the Fay estate applied for (and subsequently received) permission to cut connecting doors between 188 and 190 Commonwealth. By 1929, 190 Commonwealth was the home of Harry A. S. Read, a carpet salesman, and his wife, Elizabeth M. (Dean) Read, who operated it as a lodging house. They previously had lived in Andover. They continued to live at 190 Commonwealth until about 1931. By 1932, 190 Commonwealth also was the headquarters of the Daughters of the American Revolution. By 1933, they were the only tenant listed there in the City Directories. They continued to be located there in 1938. 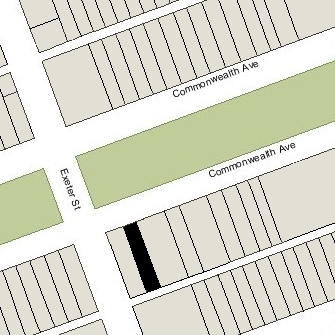 By 1939, 190 Commonwealth no longer was listed in the City Directories, and it appears that it had been consolidated with The Abbotsford at 184-186-188 Commonwealth. On October 2, 1939, 184-186-188-190 Commonwealth were acquired from the Fay estate by Webster Properties, Inc. of which Abraham M. Sonnabend was president. The property subsequently changed hands and in April of 1952 was purchased by Murray R. Fine, trustee of the Abbotsford Realty Trust. In March of 1954, he filed an affidavit with the Building Department verifying that the occupancy of 190 Commonwealth was ten units when he purchased the property, and had been leased as such ever since. The property changed hands and on May 1, 1979, was purchased by Kevin O’Reilly and Stephen V. Miller, trustees of the 174-178 Commonwealth Renewal Trust, who transferred the property to themselves as trustees of 184-190 Commonwealth Renewal Trust. On October 4, 1979, they converted the property into fifty condominium units (41 in 184-186-188 Commonwealth and nine in 190 Commonwealth), The 184-190 Commonwealth Condominium.